It’s no surprise that outdoor kitchens are one of the most desired backyard landscape design additions. 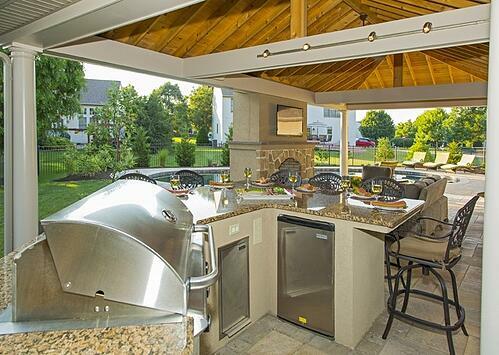 In fact, here at Earth, Turf, & Wood, about half of the outdoor living areas we create in Lancaster, Reading, York, Lebanon or Hershey include an outdoor kitchen! Homeowners are expanding homes past their four walls and creating connecting outdoor rooms and entertainment spaces right next to their pool or pond. Forget small gas grills, carting armfuls of dishes and food down steps to the patio. 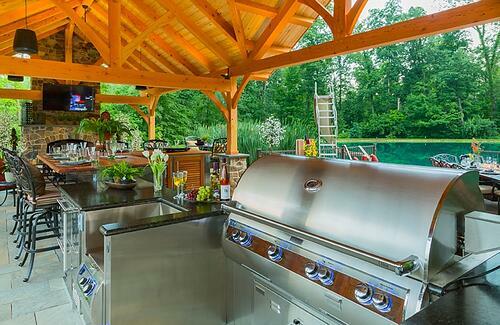 An outdoor kitchen brings a fully-functioning, convenient culinary experience to the great outdoors. Adding these outdoor kitchen ideas to your project means being able to get maximum use out of your outdoor space, making it a favorite destination for your family and friends. Earth, Turf, & Wood has a long and successful experience with designing and installing outdoor kitchens in the various areas surrounding our location in Lancaster County, PA. Our Registered Landscape Architect will work with you to create a truly unique design you wouldn’t just find on another one of our client’s properties. We’ll help you decide which elements are needed in your kitchen, and guide you through the process of selecting superior, professional-grade appliances and products for an outdoor space that will endure the test of time. Our team of experienced in-house installers don’t just work on a few outdoor kitchens each year. These types of projects are one of their routine specialties, and they will meticulously attend to each detail. We invite you to learn more about outdoor kitchen design and installation, as well as what makes Earth, Turf, & Wood our area’s leading outdoor kitchen contractor. Check out some of our projects below, and when you’re ready, schedule a free consultation.